In 1994 the Khomani San “bushmen” community successfully reclaimed land inside and outside the Kgalagadi Transfrontier Park. Yet despite ownership of a portion of land still part of the Kgalagadi Transfrontier Park, the Khomani San community has never directly benefited from tourism revenues from entrance fees. EPRU researchers show how voluntary donations earmarked for the Khomani San community by park visitors above their entrance fees can be the first step to a better distribution of park profits among stakeholders. Furthermore, the researchers show that the Khomani San community does value biodiversity conservation in its area making it a reliable partner in conservation. In 1913 the Khomani San were forcefully removed from their land to make way for a national park in the Kalahari, or Kgalagadi, desert in Southern Africa. Today the Kgalagadi Transfrontier Park stretches between Botswana and South Africa but also borders Namibia, with access from all three countries and 25 percent of its area in South Africa. It is located 904 km from Johannesburg and 1,080 km from Cape Town, with the closest airport in Upington 260 km from the park. After the first democratic elections in 1994, the South African government initiated a land reform program provided for by the Restitution of Land Rights Act 22 of 1994. “This meant a significant change in land ownership in the Kalahari area, with implications for conservation and sustainability issues,” says Johane Dikgang, EfD South Africa/EPRU Junior Research Fellow, who is working on his PhD thesis titled Developing a system for sustainable resource use by the Khomani San in Kgalagadi Transfrontier Park and environment: Valuing sustainable resource use. The Kgalagadi Transfrontier Park is co-managed by the SANParks, the Khomani San community and the adjacent Mier community. The latter was also given land within the park in May 2002. In addition to land, the vulnerable Khomani San community was awarded the right to sustainable harvesting for cultural, traditional and symbolic purposes, both inside and outside the park. 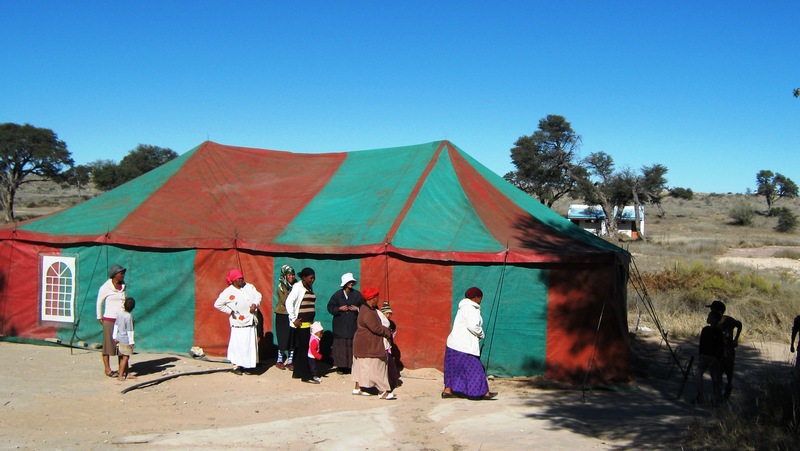 “The SANParks agency has for sometime been contemplating giving the Khomani San community access to the broader park to exercise their cultural, traditional and symbolic uses in accordance with the land claim agreement but has been concerned about whether such access could result in the overutilization of natural resources within the park. They therefore published a call for interest in research in the Kalahari area to help them decide on the way forward, and this is how we got involved in 2009,” says Johane Dikgang - left, together with Patet from the Khomani San community about 50 km from the Kgalagadi Transfrontier Park in the Khomani San Farmlands, Mier Local Municipality, Northern Cape Province. Dikgang is supervised by Dr. Edwin Muchapondwa, EfD Senior Research Fellow and Associate Professor at the University of Cape Town. Muchapondwa has extensive experience in environmental economics research on national parks in Southern Africa. In addition to the University of Cape Town, the University of Stellenbosch and Rhodes University are also involved in research projects in the area. In 2009 representatives from the Khomani San and Mier communities met with researchers to develop research projects to explore and document resource use and its implications. In 2011 they met again to verify and share the findings of the research. Fifty-five representatives from the Khomani San and Mier communities attended the workshop, together with researchers from the three universities. SANParks arranged both meetings. “We were concerned about how to deliver the message. We tried to focus on the implications of the results, not technical details. We drew charts and presented our findings on posters. The Khomani San and Mier representatives were really involved and interactive and could confirm our results,” says Johane Dikgang. One of his and Muchapondwa´s two studies is about estimating optimal conservation fees in the park. The idea is to ensure that the Khomani San community benefits from the tourism revenues from conservation fees since they are in joint ownership of the park. “The first thing to investigate is whether the entrance fee, the conservation fee, to the park is optimal. If the optimal entrance fee is more than what is currently charged, it perhaps suggests that there is room to extract more consumer surplus from visitors and channel it to the Khomani San community,” says Johane Dikgang. Of course, optimal pricing strategies that aim to maximize revenue for particular parks should take into consideration factors such as the presence of competing recreational sites, environmental concerns, spill-overs to local communities, quality of the visitor´s experience and the potential impact on the nature-based tourism industry as a whole. Dikgang found that revenue could be maximized by increasing conservation fees for local tourists, who tend to be mainly high income earners from major cities in the country. On the other hand, the findings also show that the conservation fees charged to international visitors are already optimal. “It is important for parks co-managed with local communities as a result of the land restitution program to play an active role in contributing positively towards the local economies. Still, the issue is highly debated in many African countries,” says Dikgang. “Our findings suggest that a review of the pricing strategy in national parks is necessary. Furthermore, there should be encouragement of the park agency to gradually share some of the revenue generated through conservation fees with the local communities. There are two ways in which this might be started. One way is to revise conservation fees to an optimal level and share the increased revenues with the local communities. Another way is to facilitate a voluntary community-bound donation by park visitors in addition to the current conservation fee.” says Dikgang. Will sharing revenues with the Khomani San community bring about improved conservation? This seems highly likely because another of the duo’s studies is on the valuation of biodiversity conservation by the Khomani San community. The findings show that the Khomani San community, which is relatively new to modern conservation and whose attitudes towards modern conservation have not been evaluated until now, generally attaches a significant economic value to biodiversity in their area. So does the adjacent Mier community, which was studied as comparison. Despite high unemployment and low household incomes, most people in the area are willing to pay to support sound conservation initiatives. However, in order for all members of the communities to support biodiversity conservation unconditionally, mechanisms for fair distribution of the associated costs and benefits should be put in place.